some of this purpose as well. Here is a picture of our original command center. READY TO SEE THE LATEST ADDITIONS? Here it is after I added the chalkboards. Now because I am truly trying to be deliberate in how I design the binder, I wanted to tweak our command center a bit to make it work even better for us. The first little “tweak” was to paint the chalkboards using left over paint from our laundry room project. household chores need to be done each day. Although you may be thinking that wasn’t exactly necessary, I am a firm believer in creating a space to motivate you to want to maintain it. and attached them to colored markers. Since I have assigned each family member a color, this makes it so much easier to grab the marker I need to add to our calendar when needed. Which leads me to our wall boxes, where I made a few minor adjustments as well. Each person already had an “Info” folder to hold things to read or do at a later date. Just sort of a place to keep personal things we aren’t ready to get rid of. We also had an “Action” folder to hold things that need to be taken care of the next few days or so. After talking to my hubs, I decided to make a “Mail” folder for him to hold his unopened mail, magazines, etc. I added a “Creative Order” folder to my pocket to hold time, expense, and mileage sheets that I need to keep record on for my business. The kids'”Info” folder is more for school info and such that changes monthly (i.e. snack schedule). The “Action” folder doesn’t get used a whole lot yet just because they are young and their “action” is typically my “action”. But the idea is that when they get a little older and hold more responsibility, this will be their folder of things like weekly homework, etc. that they need to act on. The middle “Pending” box is a condensed sort of Tickler File. I have a folder for each month of the year. This is when things come up that don’t need to be taken care of or referenced for a month or more down the road. For example, I stuck the Winter issue of the Rec Center catalog in the January folder because I knew I would be needing it this month to sign the girls up for gymnastics. 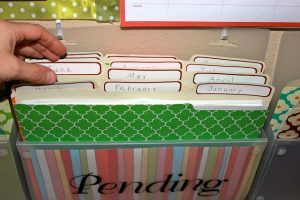 This honestly has been really handy and helps give those random papers that we don’t always know what to do with, a home. For whatever reason, I don’t have a picture of the wall pocket below this but it holds a “To be payed/Take action” folder for bills or other things that need to be taken care of on my bill paying day and a “To be filed” folder for things that need to be filed away. I pay our household bills and use a program called Quicken to do so. I will try and do a post to describe our bill-paying method in more detail one of these days. Now that we do them this way, I would never do it any other way.